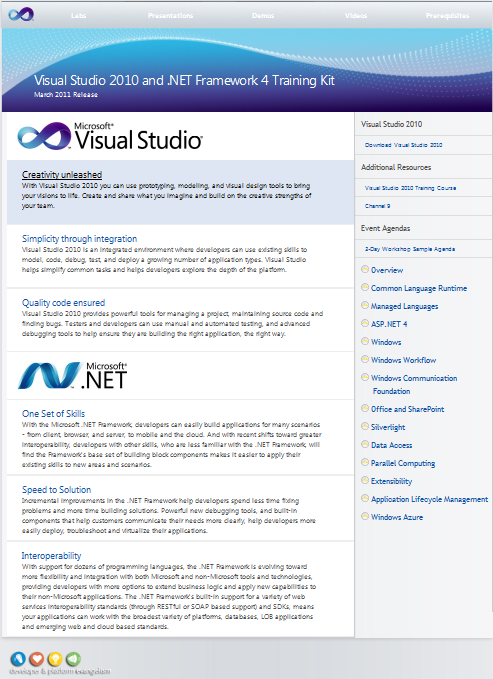 Microsoft yesterday published for download the March 2011 release of the Visual Studio 2010 and .NET Framework 4 Training Kit. You can download the kit from here. This training kit includes presentations, hands-on labs, and demos, covering the latest topics in the recently updated versions of Visual Studio 2010 and .NET Framework 4. Enjoy. The final version of the Visual Studio 2010 Server Pack 1 is available since yesterday for MSDN susbscribers. The list of new features and fixes is available here. Generate code from UML class diagrams. Create UML class diagrams from code. Import UML class, sequence, and use case elements from XMI 2.1 files. Create and view links from work items to model elements. Generate dependency graphs for ASP.NET Web, C, and C++ projects. Create and validate layer diagrams for C and C++ code. Write custom code to create, modify, and validate layer diagrams. 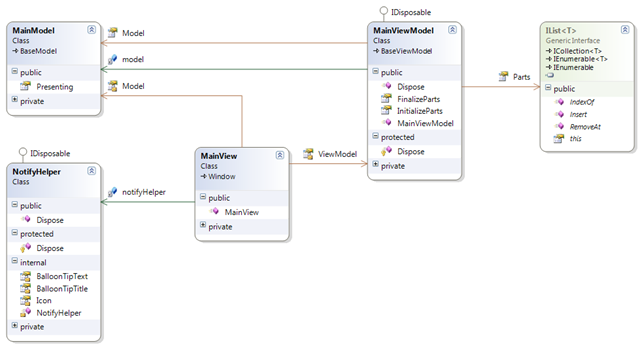 Do you recognize how the Model View View Model pattern was used? It is easy from the diagram, is not it? 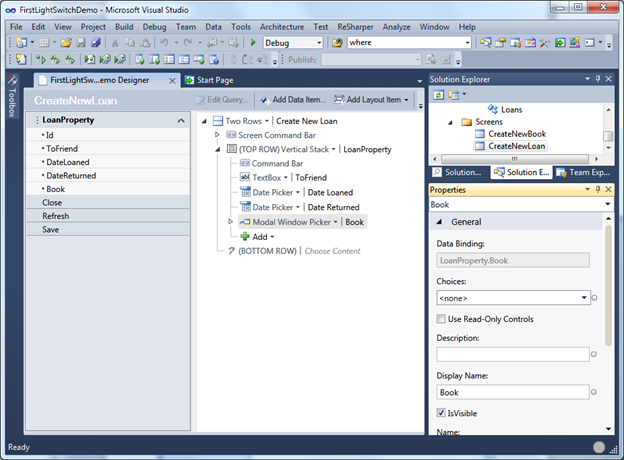 This is the first post of a series about testing tools and techniques using Visual Studio 2010, Team Foundation Server 2010, Microsoft Test Manager 2010, and C# 4.0. One of the things you find after using Visual Studio for a while is that the amount of features and commands is longer than the menu, i.e., there are some features that do not appear as commands in the menu. You have already seen that, have not you? Unfortunately this feature is not accessible from the menu. I do not hesitate to recognize that sometimes my lack of fine motor function impedes me to do this as fast as I wanted to. But, did you know there is a key combination to do this without using the mouse? You just need to press Ctrl+Point at the same time. This not only solves my lack of fine motor function, but also prevents me to move my hands out of the keyboard. I always remark the increase in productivity resulting for saving a second or a click in those tasks we perform many times per day, because at the end of the day we save many seconds and many clicks. There is more than one poster available, one for each keyboard combination associated to a language (the one you choose the first time you use Visual Studio). Download the file, print it, fix it to your box’s wall. Give it a chance and then you tell me.